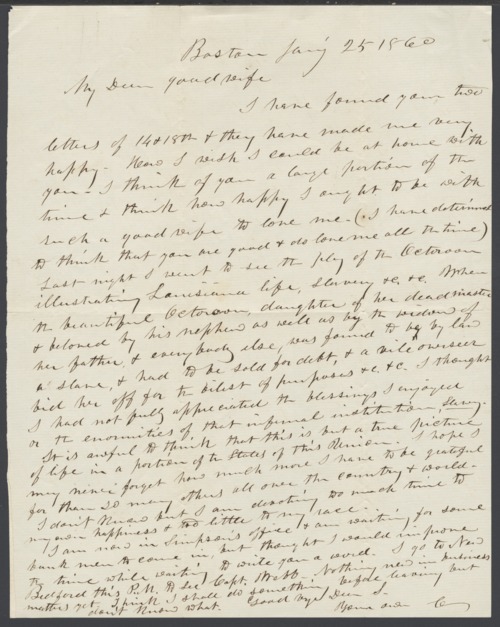 A letter written by Charles Robinson, from Boston, Massachusetts, to his wife, Sara Tappan Doolittle Robinson. He writes about attending Octoroon, a play about slavery, and his feelings for the "infernal institution of slavery." Robinson thinks the play conveys a true picture of conditions in the South. A searchable, full-text version of this letter is available by clicking "Text Version" below.